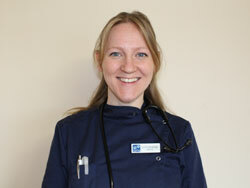 Lorna is our lead vet in Upton. Lorna first obtained a degree in zoology in Ireland, after which she moved to Budapest to study Veterinary Medicine. She has been qualified since 2011 and worked in a mixed practice before moving to London where she worked in an independent small animal hospital for 3 years. She has relocated to Dorset to enjoy a more active lifestyle and loves cycling, hiking and kayaking along the Jurassic coast. Her interests are mainly in surgery and imaging and she is currently studying towards an imaging certificate. Lorna works in our Upton Practice on Mondays, Tuesdays, Thursdays and Fridays and one in three Saturdays.